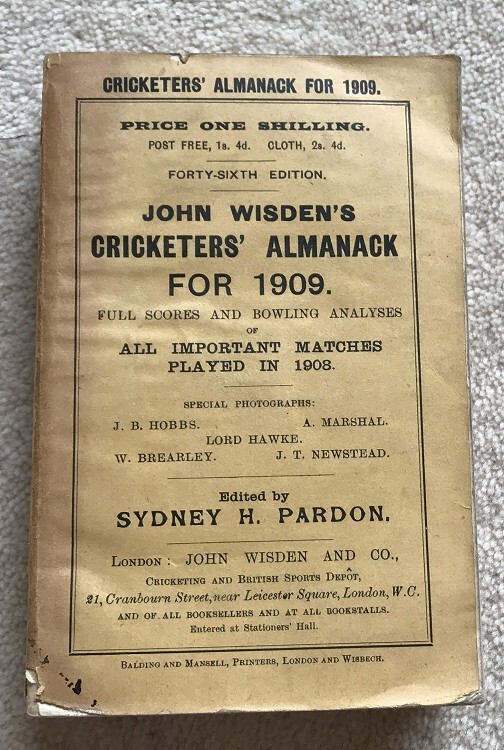 This lot is a 1909 Original Paperback Wisden. It is in Good+ Condition. The front cover is very nice other than a small ink mark to the bottom left hand corner and a tiny nick to the top. The rear cover is very nice. The spine is worth noting, one coorner has a small loss and there is a line forming from top to bottom but on holding it by the front cover the spine shows it is tightly bound still (just dont drop it down the stairs). Internally very nice clean pages and excellent photoplate a bit of crinkling to the pages which you see a lot of but overall a decent book, mark to the page block.